Spend $12,500 + on sponsorships and receive Premier Benefits. Spend $5,000 - $12,499 on sponsorships and receive Signature Benefits. Spend $1,500 - $4,999 on sponsorships and receive Select Benefits. Are you ready for your work to become more rewarding -- and profitable – in every sense of the word? It’s time to ignite the creative force in yourself and every person in your organization by making human centered design central to your everyday culture. When you take a human-centered approach to your work, you begin to create better customer experiences which leads to increased engagement and growth. Conducted by the team of Nashville-based design coaches at Stoked. Stoked founders, Parker Gates and Anna Love-Mickelson are Executive Education Coaches for the d.school at Stanford University. Stoked works with organizations worldwide to rekindle their natural ability to see things in a new way. Join us and hear Waste Connections CEO Ron Mittelstaedt’s thoughts on the waste industry and its relationship with the public sector, how Waste Connections is responding to current challenges (e.g., China/recycling), the company’s successful safety initiatives, and where we are going as an industry. David Biderman, SWANA’s CEO and Executive Director, will interview Mr. Mittelstaedt. Lawrence Lecturer: Wait, Is there a Plan for This? In a study by IBM, over 5,000 C-Suite executives stated that their #1 fear for the future was the "Uberization" of their industry or marketplace. This energetic and informative session will help provide the keys in researching and determining what future disruption is coming your member’s way. 3-dynamic forces are changing every industry, as it has the taxi, real estate, publishing, and music industries. No industry is exempt from Uberization. Over the last 5 years disruption has transformed many industries, putting the association and their members at risk. The question is…Do you know what may be heading your way, that could create havoc in your industry. Tom Morrison will share with your attendees 4 visuals every executive should be looking at with future business planning, the 3 dynamic forces causing disruption, the 3 reasons why disruption is happening, and the 6 places it occurs. Curiosity is the context for all creative action. Intuition, ‪improvisation, and insight are the major components of creativity. They do not occur in a linear order; rather there is an integrative ebb and flow between them. Intuition, or pattern recognition, and improvisation, a “chaordic” (term coined for the flow between chaos and order) system that values structure and randomness, are critical to ignite the final insight. Stand Out in the Crowd! 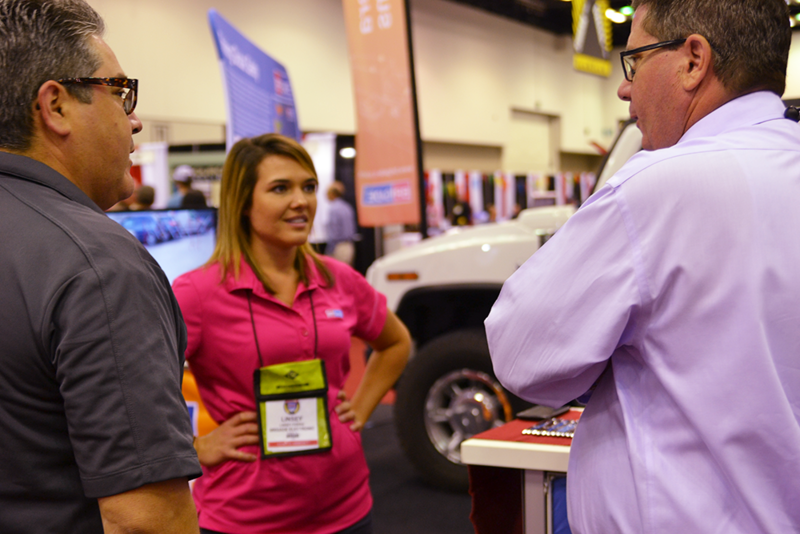 Maximize your visibility and elevate your branding with one of the premier sponsorship opportunities available at WASTECON 2018. Market your company’s solutions to professionals across the solid waste industry within WASTECON’s core assemblies at this all-inclusive event. Find the option that best suits your organization in terms of budget and scope and get noticed at WASTECON 2018! Spend $12,500 + on sponsorships and receive PREMIER Level Benefits. Spend $5,000 - $12,499 on sponsorships and receive SIGNATURE Level Benefits. Spend $1,500 - $4,999 on sponsorships and receive SELECT Level Benefits. View the benefit level comparision HERE. There is no other programming planned for this time period. The combination of complimentary cocktails and a light buffet—and attendees’ excitement about visiting the exhibit hall for the first time—guarantees maximum traffic. The Mobile App keeps show attendees connected, engaged and informed. This tool provides access to all conference details including exhibitor and sponsor directory, booth listing, Exhibit Hall map, social media, alerts and much more! Put your company logo on the mobile app and event website with a hyperlink to your company website. Your company will also be recognized as a sponsor in the show guide and on signage at the conference. This exciting opportunity will get you in front of thousands of WASTECON attendees before, during and after the show. Be one of two Lunch Break sponsors and provide much needed reprieve to attendees after a long morning of sessions, classes and touring of the exhibit floor. SWANA recognizes that, in this industry, #SafetyMatters. That’s why we've curated a program track that focuses solely on safety. Sponsor the conference that looks at the state of safety today and to learn great new techniques for building your own safety culture. The Safety Zone, in the Exhibit Hall, is where all are welcomed to learn about the latest in solid waste health and safety. This is the spot to be for the latest information, tips and, resources to keep workers safe and healthy. SELECT BENEFITS - 2 Available; each presentation sponsored individually. The solid waste industry is changing, with hot topics including repurposing materials, technology advances, and electronics recyclying at the top of the conversation list. Sponsor one of these SWANA Tours and help give insight into new fields of discovery in the solid waste industry. YPs bring in energy and drive new ideas, something that is imperative in our industry for technological improvements. Supporting the growing SWANA YP program gets your brand and name recognition in front of this pivotal demographic early in their career in solid waste management—and they won’t forget it. WASTECON 2018 is full of Sound Ideas. SWANA has put together a fantastic line-up of keynote speakers for this year's Main Stage. As a Main Stage Sponsor your brand will be showcased during each of our keynote sessions for WASTECON. Your company’s name and logo on signage, invitations, and promotional materials as well as the opportunity to meet and greet with all attendees during the session. Your company’s name and logo can appear exclusively on one side of the official conference bags distributed to all attendees and exhibitors when they register. Production included; two-color imprint. Be the first thing that exhibitors and attendees see when they check-in, when you sponsor the Registration Area. SWANA and the Institute of Scrap Recycling Industries (ISRI) present the 2018 Materials Recovery Facility (MRF) Summit. This milestone event will provide MRF owners, municipal solid waste professionals, consumer products companies, and government officials with a forum to discuss MRF issues and challenges. The summit will Kick Off on Wednesday, August 22 with a Keynote Panel to discuss the latest developments of the China markets. The summit will continue with session on new technologies, the increased efforts of brand owners and a look at industry policies. Don’t miss this opportunity to showcase your brand at this landmark event for the recycling industry. Your company’s logo on signage at coffee and refreshment breaks inside and outside the exhibit hall. Exclusively sponsoring the educational conference focused solely on waste to energy shows the industry that your company supports their efforts and is committed to their success. Insert a small promotional item into the convention bag handed to each attendee at registration. Production not included. Sponsor's logo displayed on a floor decal at the entrance to the exhibit hall (two decals per sponsor). Insert your company's postcard or promotional piece into the convention bag handed to each attendee at registration. This opportunity is limited to three total sponsors. Production not included. Draw extra attention and visibility to your booth by sponsoring your aisle. Only one decal per aisle available.